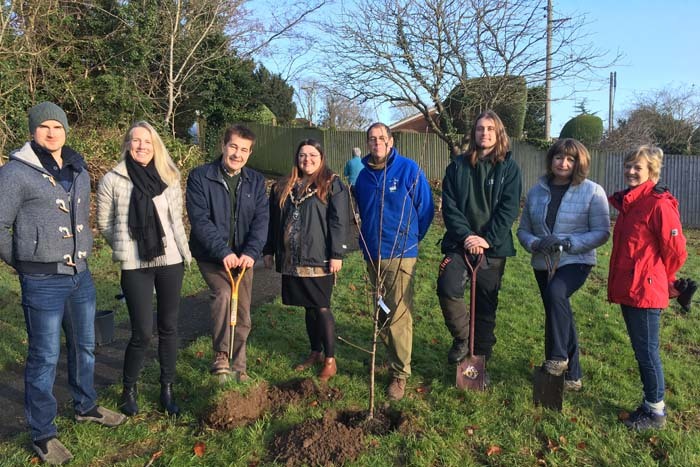 The first apple tree has been planted on Tuesday in Henley’s Community Orchard on a piece of land owned by the Town Council between Paradise Road and Leaver Road (formerly an allotment site). The rest of the orchard will be planted in January and will see a mixture of fruit trees along with blackberries and raspberries bushes. The Mayor was joined for the planting which took place in National Tree Week by Jan from the Fairmile Vineyard, Victoria from Chelsea Fringe Henley, Martin from Toad Hall who will be supplying the trees and bushes, Marcus Militello, the Town Councils’s new conservation warden and local residents. Kellie has also launched an initiative in her Mayoral year to plant a tree for every child in the town. The trees in this orchard will be part of this initiative.